Terrence Baril (Barry) on the left, Ed, on the right. 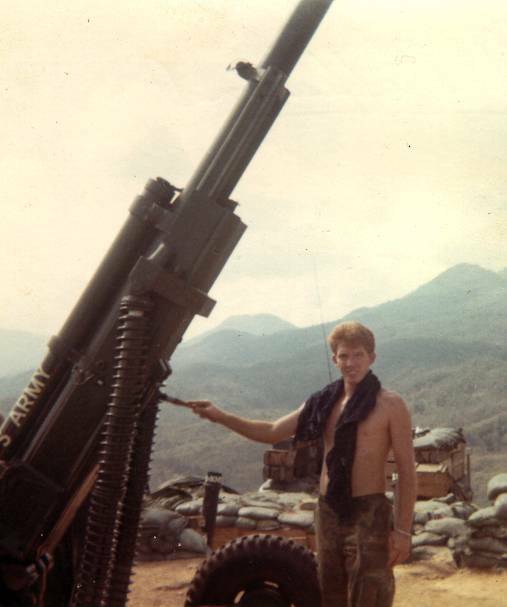 Taken on LZ Professional 1969. I found Barry today 6/24/02. I called and talked to him on the phone. He is doing just fine, married with three daughters and one grandchild. He said that he had tried to put Vietnam behind closed doors. I told him that I understood what he was saying. I hope to hear from Barry one of these days when he comes home. Young Indian from Arizona on the left, I can't remember his real name. 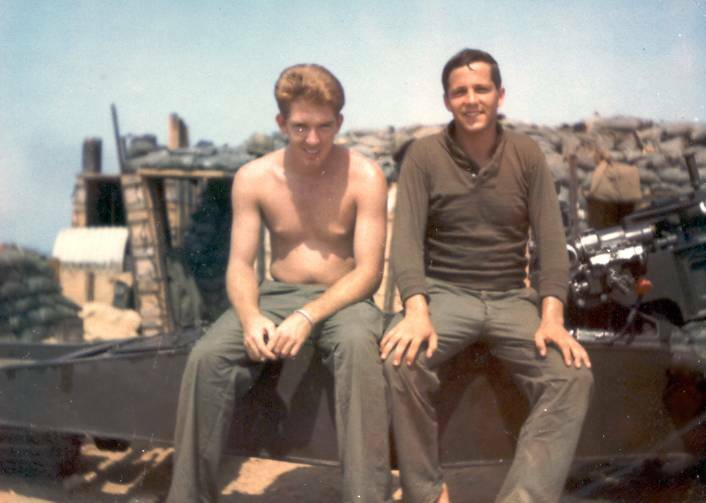 Baril (Barry) is on the right. These boys are not getting ready for a BBQ. Bob Agans LZ Professional 1969. From what I know this picture was taken just before Bob was hurt and sent home in February 1969. Sp4. Clarence Marrs first of May 1969. The ridge line behind me is where some of the rockets that we were hit with came from. 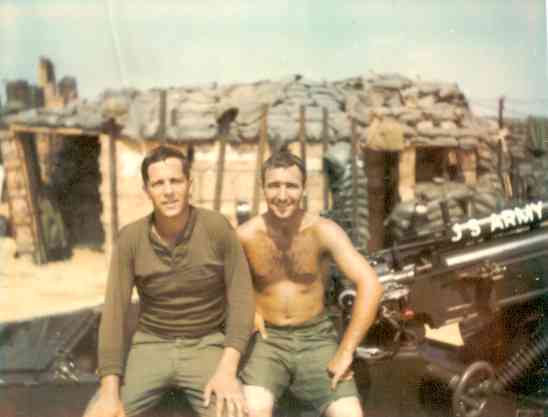 Tommy Lively from Virgina on the left and Clarence Marrs on the right. 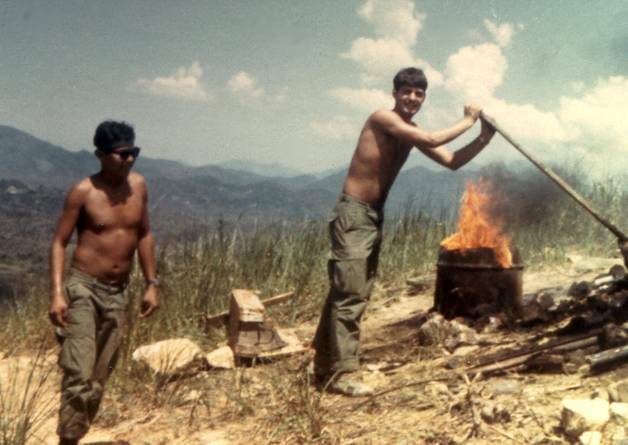 Fire mission LZ Professional 1969. 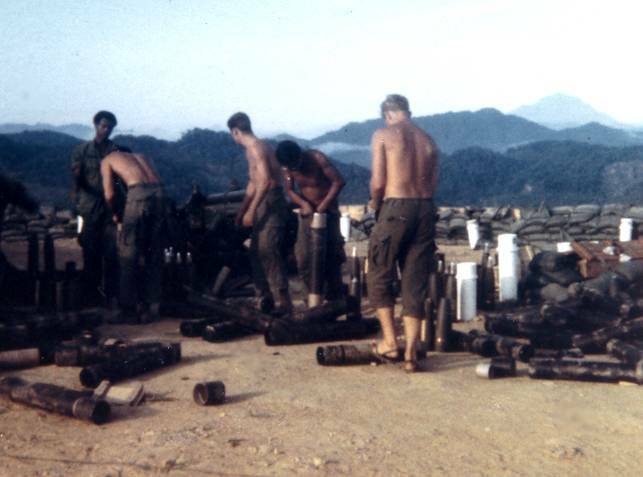 One of the gun crews breaking down ammo. LZ Professional 1969. 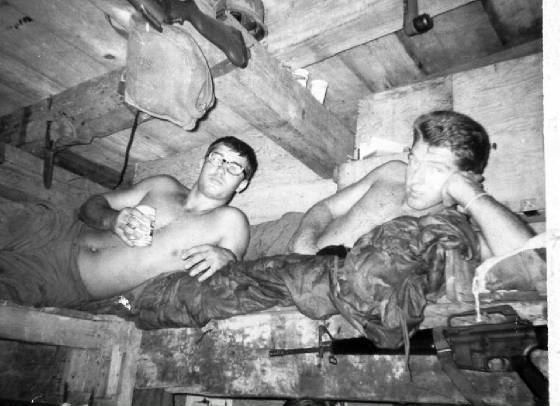 Earl McGreger from Mississippi on the left and Clarence Marrs on the right in a hooch on LZ Professional 1969. As you can see, we are layed back drinking a beer. McGreger didn't wear glasses. If you look close enough, they made his eyes cross-eyed. Just a little fun once in awhile never hurts anyone. 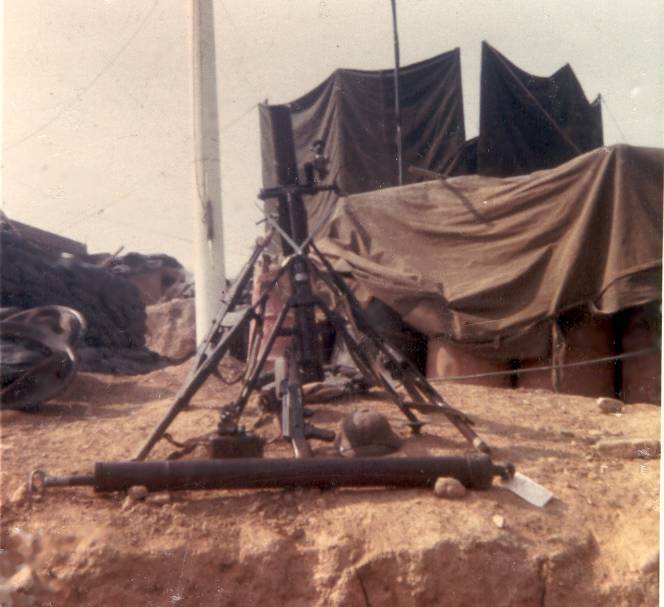 April 1969, Memorial Service for Spec. 4 Clifton Dennis Potts from Raleigh, IL. 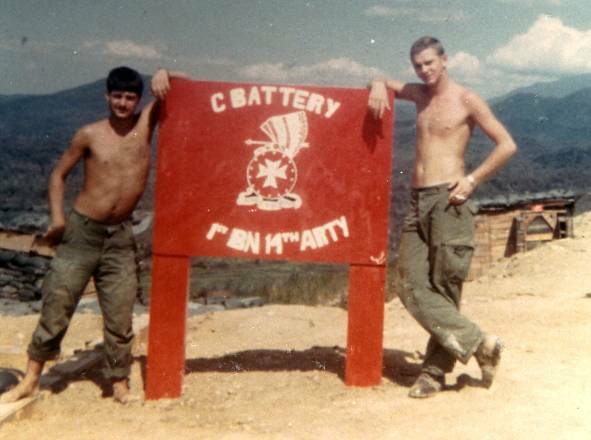 He was our first man killed in Charlie Battery during my time in country. 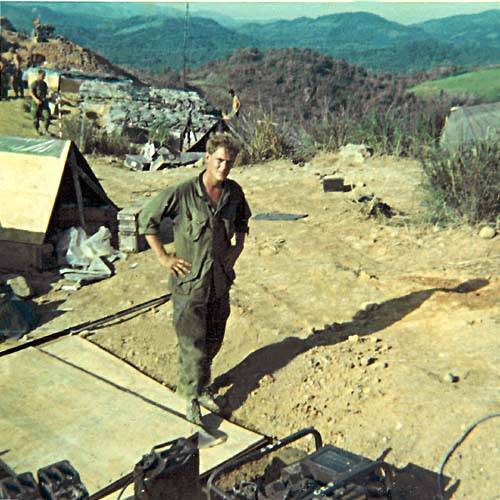 He was killed by a sniper on the lower chopper pad, around 2PM on April 11, 1969 while hooking up a load to go out on a chopper on LZ Professional. Clarence Marrs on the left and Tommy Lively on the right. 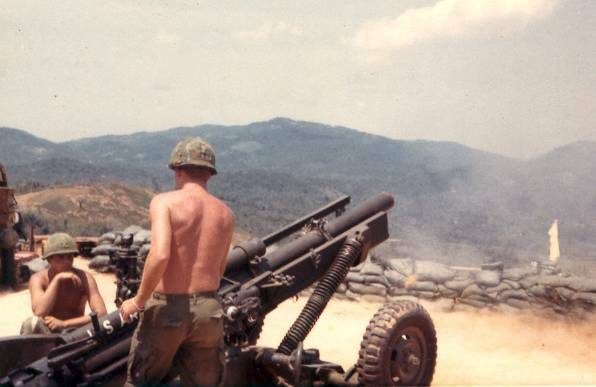 Picture was taken on LZ Professional the first part of May 1969. Tommy, I would sure like to talk to you. Tommy Lively on the left and LaVaughn Baird (Alabama) on the right. Gun #1 first of May 1969. 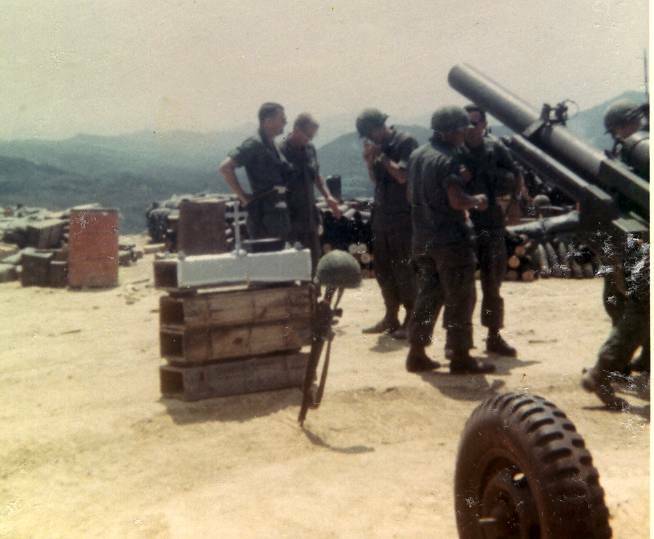 NVA weapons brought in by the 1-52nd or the 1-46th on LZ Professional around Febuary or March,1969. This is a photo that I took myself. I think this same photo is on someone else's web site? These are NVA weapons, chicom grenades, land mines, rpg rockets, and some dud US mortar rounds. 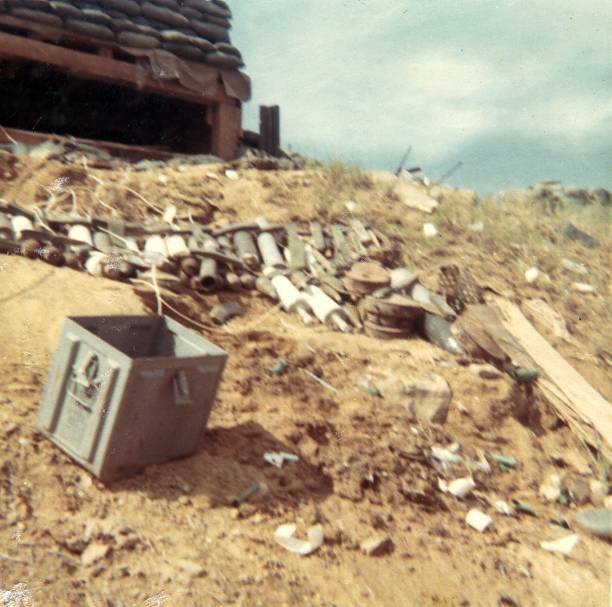 This bunker that you see is the one blown up Mother's Day 1969. LZ Professional, May 1969.